Halloween Is Such A Fun Time Of Year! 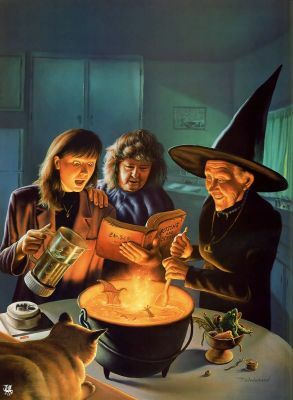 The imagination can truly run wild when you find a nice picture of a witch and a boiling cauldron. The book could be a normal recipe book . . . not some book of spells to bewitch the neighborhood . . . They could be making a nice stew with fresh herbs and spices for a cold fall evening meal. Maybe it is more fun to imagine something magical or mysterious. A love potion . . . a prosperity spell . . . or some recipe for disaster . . . Honestly, would someone truly want disaster? I would hope not . . . life is full of good times and difficult times . . . and we get through them all . . . wanting much more good in our lives. I think witches have been given a bad reputation . . . there are good witches . . . and those who don’t seem to do good things . . . just as there are people who make wrong choices . . . I choose to think more positively and my imagination goes toward these women brewing something good . . . yet, given the look of the liquid in the cauldron . . . something interesting is brewing . . . It does look like an old book . . . and what is in the pitcher? The expression on the witch’s face has me a bit concerned . . . I do wonder what has been placed inside the cauldron . . . and what is the woman with the pitcher saying? Is it some magic spell? Quite some time ago, I was at a local antique mall where people sell their family treasures . . . or estate sale finds. I’ve bought quite a few antiques over the years . . . but nothing like what the woman I met there told me . . . I’ll call her Myrtle . . . she looked like a friend of my mother’s with that name. She found this old cookbook. She was looking for old family recipes. Well, she had one collection of them . . . but there was another book of them she was desperate to find. It seems her daughter was in the attic and decided to clean things out and sell them to pay her rent. She had recently lost her job and was working at the local diner. She needed a better paying job, but by selling some of her grandmother’s old stuff, she was making ends meet. This did put a new slant on it . . . Myrtle was looking for special recipes . . . with special ingredients . . . that made things happen . . . I wanted to hear Myrtle’s story . . . but I wasn’t sure she would tell me what I needed to know . . . I was willing to help her find the book . . . as a matter of fact I think I had the book she was seeking. I loved the old binding of the book and thought it would look good on my book shelf along with my Halloween paper crafts. The pages were cross referenced without any real recipes inside. The old calligraphy was beautiful and I thought it was interesting. Evidently, alone each book didn’t have “the power” or information necessary to make anything happen. The more Myrtle spoke, the more determined I was to keep the two books separate. There are just some things that should be hidden away in an attic . . . or separated . . . never to be joined together again. I knew my intentions for the old book, but I didn’t know Myrtle’s. This is one of those moral dilemmas we don’t like facing . . . but I faced mine and decided that there was a reason Myrtle’s mother kept the books separate for all these years . . . and a reason Myrtle never thought to put them together . . . until now . . . And she wasn’t going to tell me about it. I think things happen for a reason. I believe those two books were separated on purpose and should remain separated . . . and there’s always the possibility that Myrtle’s book and mine are not the pair she’s seeking. I don’t know . . . What do you think? This time of year I do think about Myrtle and her daughter . . . and the book . . . I do wonder if Myrtle ever found it . . . or if I have it . . . It looks very similar to Ray O’Bannon’s book safe. This is a fun free printable you can make, display on your bookshelf or coffee table or give as gifts filled with fun fall treats. Or keep your family secret recipes . . . They are easy to make and fun for all ages. Click the link above to go to my earlier post with the links to RavensBlight’s book safes. They come in two styles for your crafting pleasure. I have one filled with odds and ends of ephemera I’ll use sometime in one of my mini-albums. It’s a nice place for old photographs, too. Or even, antique mall finds you want to keep safe. I do hope you enjoyed my story . . . and will make some book safes for your friends and family . . . You can add a title to your book . . . maybe even change the cover to give it a more personal look and feel for your fall favor box. I would hope people would save these boxes and keep them for their own keepsakes or treasures after the goodies I put inside are gone. Uncle Harold just wants to have fun! You’ve already met his sister, Aunt Ruth . . . and made that image into a Card In A Box. Now you can do the same with Uncle Harold. Click the link above to meet Aunt Ruth if you haven’t already . 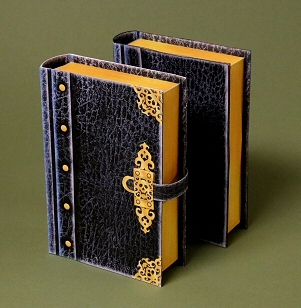 . . and learn how to make a Card In A Box. You can download Uncle Harold by clicking the picture to the right. I have a PDF for you. You may have to print out more than one copy so you’ll have plenty of pieces to cut out and put in your Card In A Box. Also feel free to add other elements. I do like the vintage feel of this picture . . . and the one of Aunt Ruth, too. They remind me of Halloween trick-or-treating when I was a kid. It was truly magical . . . running around the neighborhood getting candy from each house . . . and knowing I was safe because Dad was waiting on the sidewalk talking with other fathers while they waited for us to get some candy in out bags. My neighborhood is the same . . . I do like seeing the kids and saying hello to their parents, too. It is a nice family friendly night. It’s after all the trick-or-treaters go home . . . and the neighborhood is quiet is when I go for a brief walk . . . I see dropped candy on the sidewalk . . . I can hear my footsteps as they echo up the street . . . It is eerrily calm . . . almost too calm . . . and my imagination goes into high gear . . . It is just the right setting to get me in the mood to read my favorite Halloween story . . . The Legend of Sleepy Hollow by Washington Irving. Every year I read of Sleepy Hollow and the schoolmaster Ichabod Crane and his misadventure that Halloween Night. What To Do With Aunt Ruth? Aunt Ruth has always been a bit strange . . . but you have to love her. Yes, she is a lovely woman . . . and she has some interesting friends . . . and pets. 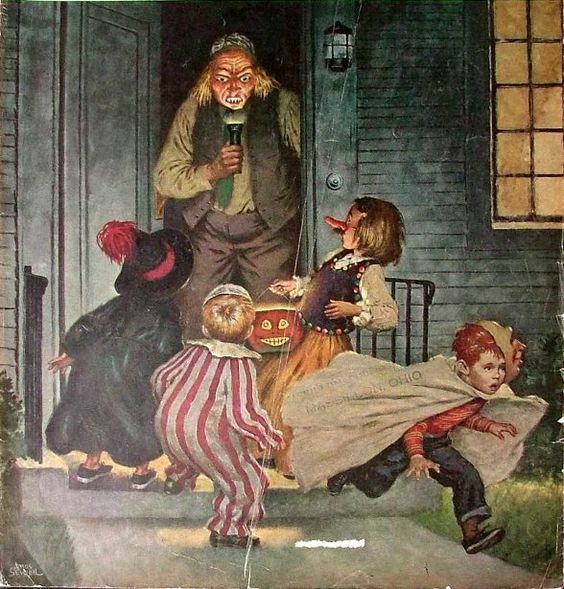 The neighborhood children come around on Halloween . . . but I’m afraid the word is going to get out . 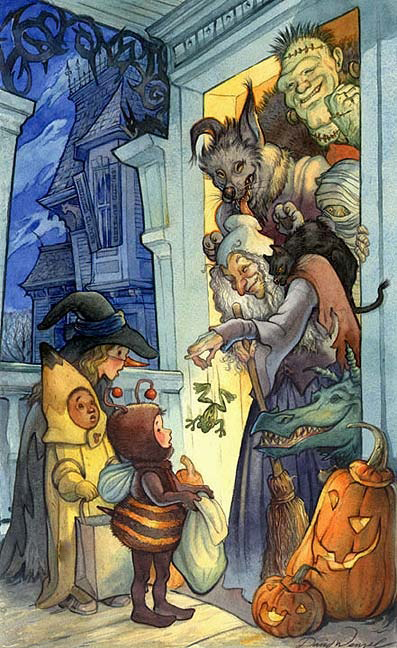 . . .unless they realize Aunt Ruth and her friends are just having fun celebrating All Hollow’s Eve. I do love this picture and have been wondering how to make it three dimensional. I could print out several pictures of this and cut out all the pieces and layer them . . . I do wonder what the main focal point is of this picture . . . the children or those within the open door? At least Aunt Ruth gave her pet frog Homer as a treat instead of an apple . . . This is one of those vintage pictures I’m so fond of sharing. You can click the image to the right and print it out. I would be curious to see how you use this picture. I may focus on popping up the children and maybe the pumpkins and allowing Aunt Ruth and her friends to remain in the background. Homer, the frog, may need to be a bit dimensional, too . . . This may be one of those images that belong in a mini-album or maybe I could make it into a Card-In-A-Box. I believe that would work out perfectly. Everything would be dimensional . . . I do believe this would be a great way for me to share this images with my friends and family . . . and a way for them to keep it and display it every Halloween . . . or when Aunt Ruth comes to visit. I do like the Card-In-A-Box concept because it folds flat to put in an envelope for mailing and is easily popped up to display on a table top, mantel or shelf. Here’s a YouTube Video Tutorial in case you aren’t familiar with this. Yes, they are easy to make . . . and fun, too. I thought this video would give you the basics of what you need to know in order to create your own Card-In-A-Box. I know some people like to see the whole thing put together step-by-step, but for the purpose of this post I thought the basics was all you needed. Feel free to check out other YouTube Videos on the subject. Ray Keim of Haunted Dimensions has some creepy facades you may enjoy making this fall. There are two facades and my favorite one — the Skoolhouse. They are all fun to make and display on your buffet table for your Halloween Party. These make great centerpieces and also look frightfully fun for a coffee table or entry table . . . even a bookcase. 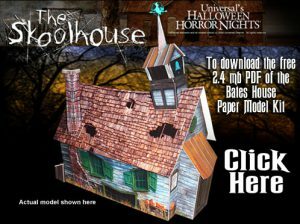 You’ll have the makings of a great Halloween Village with these. 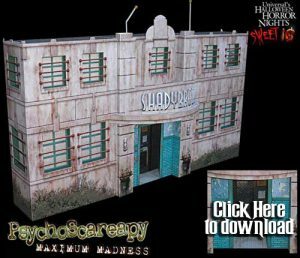 Click the image of Psycholoscarapy to the right for the PDF to download and print out. 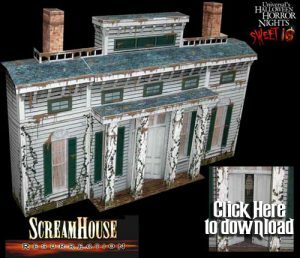 And while you’re at it click the image of ScreamHouse and also of the SkoolHouse to have the whole collection of Universal Orlando’s Halloween Horror Nights. 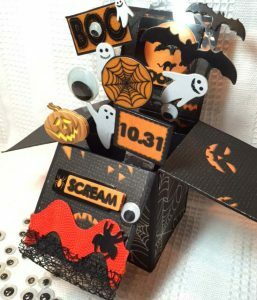 You may also want to hang out at Haunted Dimensions for awhile and get some more great paper crafts printables you can make for your Halloween decor or for family and friends. A donation would be nice to help keep these great paper crafts free. Ray Keim is a great artist and has a wonderful website of scary things you may enjoy. I am quite fond of this SkoolHouse and have had it up since August for Back-to-School. I’ve also added some monsters from Ray O’Bannon’s RavensBlight toy shop . . . He has a few characters I thought would add to the feeling of going back to school. It may be unfair to speak unfavorably about the lunchroom selection of food. I know when I went to school in the dark ages our school lunches weren’t too bad . . . not like Mom’s cooking, but I did like their Chili Beans on a cold rainy day . . . And back then those lunches were only 35¢ . . . unbelievable, huh? Those were the days . . . and since then there have been movies about the cafeteria lady . . . and maybe the janitor, too . . .
All the scare the wits out of kids . . . or to make them wonder . . . is it possible? Did Harry move away . . . or did something . . . or someone get him? 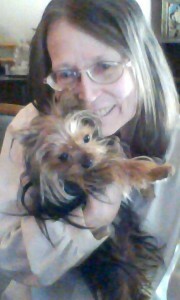 Then there was sweet Marsha . . . she wasn’t around one day after school . . . hummm, I don’t remember seeing her after lunch . . . And, then there’s Bobby and Sam . . . Lisa and what was her name . . . ? Makes you wonder doesn’t it? Which one of these culprits could have done the dirty deed? Now that pumpkinhead scarecrow has my vote, but the innkeeper with the bloody apron would make a wonderful cafeteria lady . . . and the mortician would be a great principal and the witches could be teachers . . . Now the pirates would be great yard supervisors . . . and having some monsters around would keep the kids in line . . .
Ray O’Bannon has another set of these monsters I should include . . .
Just remember the click the image and you’ll find the PDF to print out. I don’t know about this second set . . . A mad scientist might work out . . . a vampire and a skeleton ghost may be interesting . . . or the bride and groom . . . They were high school sweethearts . . . I just like giving you a selection . . . Ray Keim and Ray O’Bannon are the go-to people when it comes to wanting some haunted places . . . and Ray O’Bannon has his monsters and other toys you may find interesting. Ray O’Bannon has been busy at RavensBlight creating new papercraft toys for his visitors. One caught my eye . . . an eye catcher . . . Which is actually catching an eye on a strong . . . A fun hand-eye-coordination thing you may enjoy making for your family . . .
Click the image on the right to be taken to the PDF to print out. Click Here for the assembly instructions. 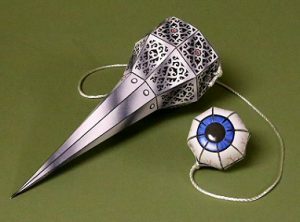 I do like the eye and may use it in other projects . . . Be sure to check out Ray’s other toys . . . He has a fun golf game that may get you right into the Halloween spirit . . .
To me it seems more like a variation to croquet, but Ray can name his game whatever he prefers. There are so great eyes again . . . Can you imagine terrifying your friends and family by bringing out this Cleaver Golf game? Click the image on the left for the PDF. Here are the Cleaver Golf assembly instructions. These may be a great hit at your Halloween party. I think I may make up a bunch of those eyes and put them in a big bowl . . . I wonder about a friendly game of pool . . . or perhaps put little treats inside . . . A little jingle bell may be a nice touch . . . For the eye-catcher, too. I believe Ray O’Bannon is a clever artist . . . His games and images go to the mysteries of the paranormal . . . His does give a colorful history of how this golf game was created . . . yet it does play a bit more like croquet with the hoops . . . and the cleavers . 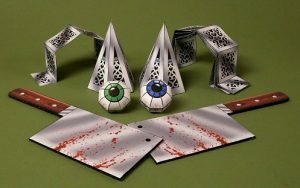 . . but I’m not going to argue with the creator of this game, I just delighted he has these free to print out and make. Although I may be feeling a bit creeped out at the moment, I do hope these Ray O’Bannon games will find a place in your home in which to play . . . I did want to give you something fun to have for the official opening of this fall season.